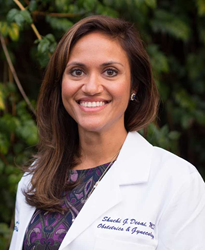 Female Plano OBGYN Shuchi Desai, MD joins the Women’s Specialists of Plano team providing comprehensive obstetrics and gynecologic care to patients in Plano, Frisco and Dallas, Texas. “I believe in compassionate, comprehensive, and personalized OB/GYN care that is a lifelong partnership between patient and provider,” said female Plano OBGYN Dr. Shuchi Desai. Drs. Daryl Greebon, Jules Monier, Elizabeth Coronado and Quyen Dang welcome Dr. Shuchi Desai to the Women’s Specialists of Plano team. Dr. Desai is a trusted and reliable female Plano OBGYN dedicated to caring for women in the Plano, Frisco and Dallas communities. Dr. Desai believes in listening to each patient and creating a partnership to maintain and improve lifelong health. As a Plano Obstetrician-Gynecologist, Dr. Desai specializes in minimally invasive gynecology, complete pregnancy care, women’s preventative care, menopausal transition, contraceptive counseling and adolescent gynecology. In addition to English, Dr. Desai welcomes patients that speak French, Hindi and Gujarati. Dr. Desai attended the University of Texas Southwestern Medical School in Dallas, Texas where she graduated with the honors of Alpha Omega Alpha. Following medical school, she completed her residency in Obstetrics and Gynecology at Washington University in St. Louis, which is recognized as one of the top programs in the nation. During medical school and residency, Dr. Desai participated in obstetric and gynecologic research that focused on ovarian reserve and infertility as well as, the influence of obesity on menstrual bleeding with the contraceptive method of the Mirena IUD. Her research has been published in peer-reviewed journals and presented at national meetings. “I believe in compassionate, comprehensive, and personalized OBGYN care that is a lifelong partnership between patient and provider,” said Plano Obstetrician-Gynecologist Dr. Shuchi Desai. Women’s Specialists of Plano (WSOP) Obstetrician-Gynecologist practice provide care from adolescent gynecology to menopause treatment to women in Plano, Frisco and North Dallas. The team of both male and female Plano OBGYN physicians at WSOP strives to bring the most innovative treatment options to patients in North Texas. Gynecological services include minimally invasive surgical treatments such as da Vinci Robotic Surgery, a full range of laparoscopic and hysteroscopic procedures, and in-office endometrial ablation.